Been searching but didn’t find a definitive answer. Is there a way to use Chromecast or similar to stream from my laptop to another monitor, or two? I hate having to get up go to the computer by the monitor to make changes. Or is there something other way to do what I need? I think the general solution is just to use remote control software, like VNC or TeamViewer. These allow you to remotely connect and control a PC over the network. Chromecast is an option, too, I think. Doesn't the Chrome browser plug-in allow you to stream your screen to the Chromecast device? Yes it does. I just wasn't sure if it would work with TD since is runs more like an app. I haven't tried it, to be honest. I know the plug-in will cast a browser tab, but I think it also will cast a screen. But I could be wrong. I'm using the program AirParrot to cast my 2:nd screen (game window) to 2 chromecast on other TVs. You need a decent computer and wireless network to make it work. If i cast to only one its more stable, and casting to a wired apple TV seems to work best. You can only cast a Chrome browser tab or a video player that supports Chromecast, like YouTube. I don’t think your other suggestions will work for me as I am just trying to cast my laptop screen to a flatscreen TV. 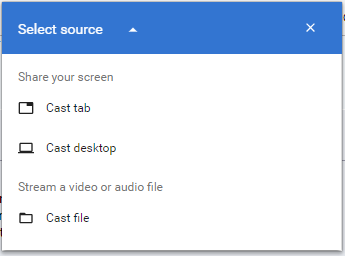 When I click the Chromecast extension button in Chrome, I see options to "Cast tab", "Cast desktop", or "Cast file" (which is titled "Stream a video or audio file"). When I cast my desktop, it allows me to select which one (I have two displays). I see the entire desktop with all open applications on the TV. I never knew there was a drop down tab to “Select Source.” All I had seen before were the two Chromecast devices I have. Problem solved.